Create beautiful, glittery window art, 3D creations, and more with special sparkle paint! It's easy to do. 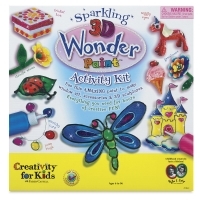 Just trace outlines with Black or Silver outline paint, then fill in your designs with an array of glittery colors. 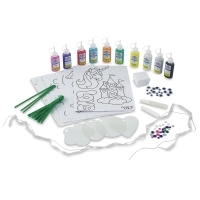 The kit includes all the accessories you need to create a beautiful trinket box, holiday ornament window art, flowers, jewelry, and more. The Faber-Castell Creativity for Kids Sparkling 3D Wonder Paint Kit includes eight colors of glitter paint, two dimensional outline paints, pattern sheets, instructions, and project ideas. ® Faber-Castell is a registered trademark.® Creativity for Kids is a registered trademark.